WASHINGTON — NASA is just 20 days away from landing a car-size rover on Mars, but mission managers might have to wait a little longer than anticipated to learn whether the challenging touchdown succeeds or not. NASA's 1-ton Curiosity rover, the centerpiece of the Mars Science Laboratory (MSL) mission, is slated to land on the Martian surface on the night of Aug. 5 to investigate whether the planet is, or ever was, capable of harboring past or present microbial life. But first, the rover will have to survive a harrowing journey through the Red Planet's atmosphere — a process that has been nicknamed the "seven minutes of terror." 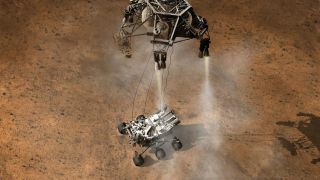 "[T]he Curiosity landing is the hardest NASA robotic mission ever attempted in the history of exploration of Mars, or any of our robot exploration," John Grunsfeld, associate administrator for NASA's Science Mission Directorate, said in a news briefing today (July 16) at the agency's headquarters in Washington, D.C. "This is risky business." Since Curiosity is too large for an airbag-assisted landing, NASA is using a complex and unprecedented sky crane system to safely lower the rover onto the surface of the Red Planet. This sequence of events — called entry, descent and landing (EDL) — will last approximately seven minutes. "Those seven minutes are the most challenging part of this entire mission," said Pete Theisinger, MSL project manager at NASA's Jet Propulsion Laboratory in Pasadena, Calif. "For the landing to succeed, hundreds of events will need to go right, many with split-second timing and all controlled autonomously by the spacecraft." As Curiosity streaks through the Martian atmosphere, the spacecraft must slow itself from roughly 13,200 mph (about 21,250 kilometers per hour) to zero in only seven minutes. The rocket-powered sky crane, which acts similar to a backpack with three nylon cords attached, will help to control the rover's descent. "EDL is like a game of dominoes," said Doug McCuistion, director of the Mars Exploration Program at NASA Headquarters. "With the release of the cruise stage, that's the first domino that's been flicked. If one of them is out of place, it's very likely that the last domino does not fall, which means MSL Curiosity may hit the ground harder than we'd like it to." To add even more drama to the situation, Curiosity's mission managers may have to wait several minutes before finding out whether the rover survived its landing. In early June, a NASA spacecraft in orbit around the Red Planet, called Mars Odyssey, suffered a malfunction on one of its reaction wheels, an instrument that helps control the probe's attitude in space. "Odyssey looks like it may not be where we expect it to be," McCuistion said. Engineers are currently assessing whether they can move Odyssey to prevent any significant communications delays, but a final decision has yet to be made. Still, all is not lost on the communications front. NASA's Mars Reconnaissance Orbiter and the European Space Agency's Mars Express will be monitoring Curiosity from above as it attempts to land on Mars. Both probes, however, will not have a full view of the event, and both are only able to collect and store information before sending it to Earth three to four hours later. "It's simply how the data gets returned to us, and how timely that data is," McCuistion said. In the meantime, mission controllers are awaiting Curiosity's landing with a mix of nerves and excitement, NASA officials said. "I think the team feels that they've done everything they can do to make this successful," Theisinger said. "That being said, success is not assured. Any one of different kinds of problems could end up in end-of-mission, but I think the team is very positive. Morale is good."